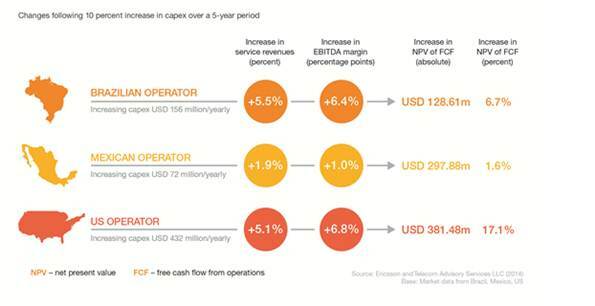 A new study commissioned by Ericsson (NASDAQ:ERIC) shows that increased level of investments in network quality and performance create sustainable competitive advantages and improved financial returns for network operators. A simulation model was constructed to estimate the effects of increased capital expenditure on mobile operators' free cash flows, allowing operators to assess the commercial and financial gains attributable to the increased investments. Johan Haeger, Head of Tactical Marketing, Business Unit Networks at Ericsson says; "The results from the quantitative study clearly demonstrate what our 'gut feeling' and discussions with leading operators has told us for quite some time: that appropriately targeted capital expenditure leads to improved network performance. This translates into better market performance which is shown to boost financial returns. "Previous extensive Consumer Lab research has found that network performance is the principal driver of subscriber loyalty. Combining these results clearly demonstrates the link between targeted capital expenditure, leading to improved network performance, which drives subscriber loyalty that translates into better market performance and financial returns."